Ushnar gro-Shadborgob is an Orc publican living in Crucible, New Sheoth. He is deathly afraid of cats, and asks you to make Bhisha the Khajiit "disappear". If you do this for him, he will reward you with one of his Skinned Hounds. Despite his ever-present stalker, Ushnar tries his best to overcome his fears and live a normal life in Crucible. He leaves the house every morning at 6am and is immediately sought out by Bhisha, but manages to walk his dog for four hours. At 10am he enters the Museum of Oddities for a guided tour by Una Armina. He returns to the streets at 1pm but quickly disappears into Sickly Bernice's Taphouse for a two-hour dinner. At 3pm, he puts up with Bhisha for another hour, then heads to the Sacellum Arden-Sul for a two-hour prayer. At 6pm, he enjoys Bernice's cooking once again, until it is time to meet up with the Duelists atop the Taphouse at 8pm. Here, he will sit down at the table and sell ale on all evenings but Morndas and Fredas when he will instead participate in the fights; on Morndas he will fight Cutter and Ma'zaddha and on Fredas he fights Cutter, Caldana Monrius, and Muurine. He returns back to his house at 10pm where he was supposed to sleep for eight hours, although a bug will cause him to wander around all night long on the ground floor. While you are doing business in the Sacellum Arden-Sul during Ritual of Accession, Ushnar will cancel his 4pm prayer and instead wander the streets, with a cat right behind him. He wears a pair of blacksmith's pants, a pair of rough leather shoes, and a patchwork shirt. He carries a Duelist's Key and his key, which strangely goes to nothing. He carries a moderate sized amount of gold. All over the Shivering Isles, people will be amused about Ushnar and his cat problem. When asked for rumors or during private conversations, they may say: "Ushnar in Crucible is afraid of cats. Cats! ", "Ushnar is deathly afraid of cats. He makes sure to keep dogs around because of it." and "There's an orc in Crucible who is deathly afraid of cats." Others will respond: "They say his fear of cats extends to the Khajiit, or pretty much anything with furry paws for feet. ", "That's ridiculous. I understand there's a Khajiit beggar that follows him around, just to annoy him. ", "Bhisha is always following him around. Ushnar would do anything to stop it." and "I've heard. He's even afraid of Khajiit. 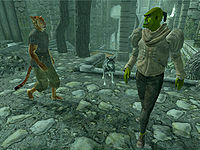 He once hid dog food in a Khajiit's clothes, just so his dog would go after her." During the quest, the last statement is backed up by Sickly Bernice: "Yeah, he eats here. Terrified of cats though. His dog can be a terror. I once saw him sic it on a guy who tried to steal the dog's food. He told me the dog can smell its food on anyone. Ushnar let that dog tear that poor Khajiit apart." In her Museum of Oddities, Una Armina will show interest in Ushnar's old dogs: "I'd love to have one of Ushnar's old dogs for my museum. They're very interesting. His new dog though, it can be mean. He's trained it to attack cats and anyone that tries to take its food. I pity the poor Khajiit that tries to steal dog food from Ushnar." If your character is anything but Khajiit, Ushnar will look at you and unhappily state: "Cats. Everywhere." Every once in a while he will approach Bhisha and yell: "Stop following me, you smelly cat!" Talking to him will net you an unflattering: "Ew. You smell worse than that cat, Bhisha. Get away from me!" or, if his disposition is above 40, a more informative: "You haven't seen that filthy cat beggar have you?" When asked about Bhisha, his disposition will once again affect his response. Ushnar may comment: "He's still around. I've seen him skulking like the filthy cat he is." although this will not start the quest. Raise his disposition above 40 and he will explain: "Yes, he's the one. Isn't he scary? I wish someone would just make him disappear." If you choose to defend Bhisha, Ushnar will hatefully say: "I bet you're a cat lover, too." If you offer to help him with his problem, Ushnar will be grateful: "You would do that for me? I would do just about anything for you if you make him go away. Permanently. For good. Never to be seen again." He will then start to ask: "Is that man-cat gone yet?" and will greet you with: "That cat beggar is following me! He's going to eat me, I just know it. Don't look! He's standing right over there." 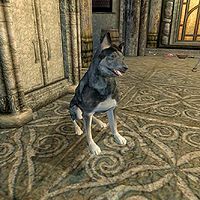 If you choose to kill Ushnar's Dog, he will sadly comment: "Yes, he's dead. It's so sad. I've already made arrangements to get a new one, but I will miss my old friend." Regardless of how you solve the quest, he will be overwhelmed: "He's gone? Truly? Oh, thank you! I know what you need. You need a dog. I happen to have one of my old ones still lying around. I'll send it to you." Talking to him again will make him say: "Wait... you're not one of them... no. You're fine. Cats. They're everywhere. But my babies protect me." and on subsequent meetings he will say: "Ever vigilant. That's my motto. They'll sneak up on you. Because they're sneaky. Sneaky fur. Sneaky whiskers." He will always finish conversation with a paranoid: "Watch for them." 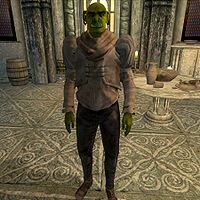 If you are a Khajiit, things are entirely different and the paranoid Orc will not even hand you the quest. In fact, he will look at you and say: "I don't like cats, which means I don't like you." and later: "Stop following me, you smelly cat!" or "Gah! Horrid beast! What do you want?" Talking to him will make him set the dog at you right away: "You... you're a cat! Get away from me! Kill! Kill the cat! Good dog." After the fight, if you approach him, he will say: "You! You're one of them! What do you want with me? Scratch me with your claws? Steal my breath? My babies will protect me!" On subsequent meetings he will change to: "Why do you torture me? I don't want any trouble with your kind! I've got dogs, you know. Vicious ones!" When spending time with the secret society of Duelists, Ushnar will often sit behind the table and sell Ale while buying food and ingredients. During transactions, he may comment: "Have a seat." or "Buy a drink and watch the fight." If you approach him, he will advice you: "This is a private gathering of our... society. You may watch, but don't interfere." Also, during the early stages of the Lady of Paranoia quest, Ushnar is the only resident outside the palace who will provide revealing info on the suspected conspiracy against Syl in the House of Dementia. 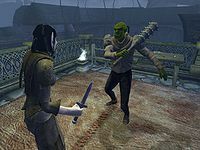 With a bit of persuasion from Herdir, the big Orc will quickly break down and say: "All I know is that word has gotten around about Anya Herrick. She looks more nervous than normal lately. People think she might be up to something!" Someone new around? Not one of those horrible cats, I hope. The Gatekeeper is dead? Who will keep out the cats? They'll be everywhere! Again the Resonator pulls men to it. But cats? No! Why? It should draw them far from here! Chalices? Who can think about chalices with the cat problem around here? Nasty beasts. Torture in the House of Dementia? I'm constantly tortured! Cats everywhere. I'm glad the Great Torch burns again. Cats hate fire. Perhaps the new ruler of Dementia will do something about the cat problem. A new ruler for Mania? Great. They don't have the same cat problems we have in Dementia. The Fringe is under attack! Probably a cat conspiracy. The new Gatekeeper will keep out those horrible Khajiit. The armies of Sheogorath are renewed. Let them march now on the horrible cats! Wipe them from the Isles! Where has Sheogorath gone? Who will save us from the cats? Won't someone think of the cats? Order is defeated, but the cats still prey on us all. Several of the Editor IDs related to Ushnar use the feminine gra-Shadborgob instead of the correct masculine name (including, for example, the Editor ID for his tombstone). These feminine names are only visible in the construction set and do not appear during standard gameplay. Although Ushnar is not an official member of the Rooftop Club faction, he is a regular participant in Crucible's rooftop duels. Ushnar was supposed to speak more humbly after the Main Quest, but the original quest dialogue always takes precedence. Therefore, the lines "I am honored, Lord. ", "That cat beggar is following me! He's going to eat me, Lord Sheogorath, I just know it. Don't look! He's standing right over there." and "You honor me, Lord. May your Realm be free of cats." will never be heard. The only used dialogue is his farewell: "I am your servant, Lord Sheogorath." Ushnar was programmed to find a bed on the ground floor between 10pm and 6am. Since his bed is located in the upstairs area, Ushnar will just wander around the ground floor all night long. This bug is fixed by version 1.5.0 of the Unofficial Shivering Isles Patch. Ushnar has the same bug as the other members of the Duelists and can often be found to be carrying huge amounts of weaponry; in his case, clubs. This bug is fixed by version 1.3.0 of the Unofficial Shivering Isles Patch. This page was last modified on 17 October 2018, at 23:51.